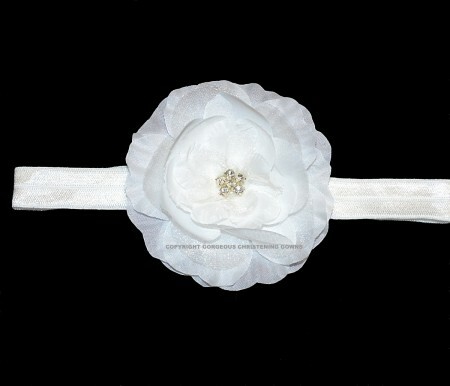 Our new White Vintage Rose headband embellished with crystals is the perfect compliment to all our collection of girls christening dresses & gowns. True vintage style, match this headband with our ‘TULLE’ gown. Simply Elegant style, match this headband with our ‘EMBROIDERED BEADED TULLE’ or ‘SILK & LACE’ gown. Little Princess style, match this headband with our ‘ALEXA’ dress.